Home > What is Pipe and Drape? What is Pipe and Drape? Everything starts with a good foundation. Pipe and drape begins with 6 lb. to 62 lb. 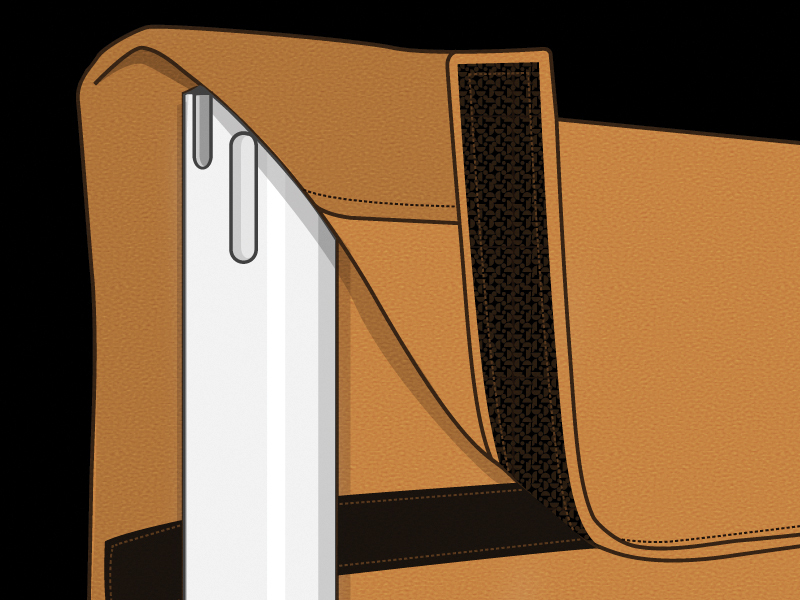 bases, as dictated by the height and weight of the drape. As required, sandbags are added for extra safety and stability. 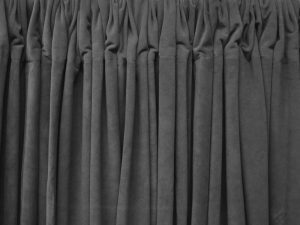 Drape Kings stocks a wide range of Inherently Flame Retardant (IFR) fabrics, from sheer to heavyweight velour, that can be used for everything from basic pipe and drape to a grand entrance or a traveler track reveal. The image shown is for reference only. 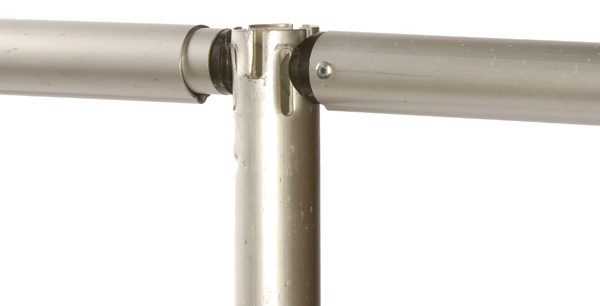 Most pipe and drape competitors use traditional upright hardware which causes the drape to “hump”, as demonstrated below. 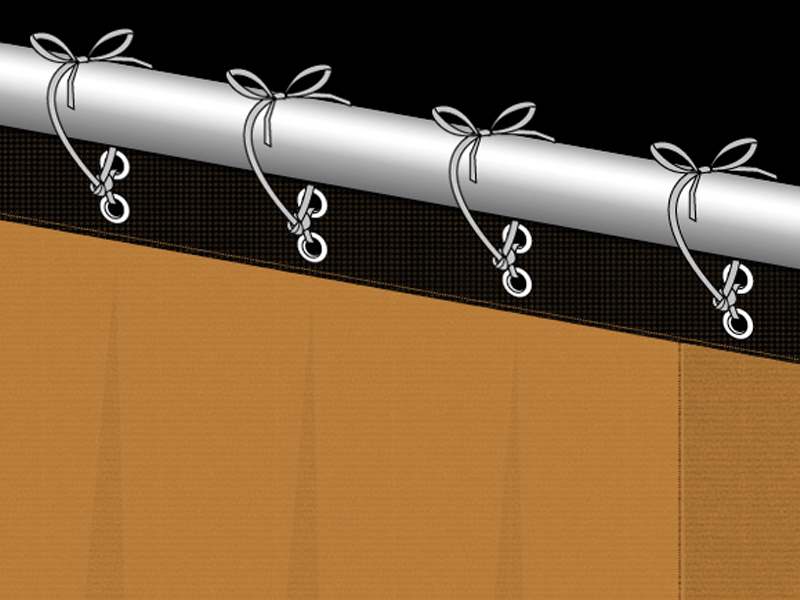 Using our No Humps hardware, your drape lays flat on the horizontal, creating a smooth, straight look. Both new Sale Hardware, and your old standard top uprights can be retrofitted with “8 Way Repair Ends” to offer the same flexibility. In the drape rental industry, the majority of curtains are sewn flat. Before hanging these curtains are un-pleated, 0 fullness. 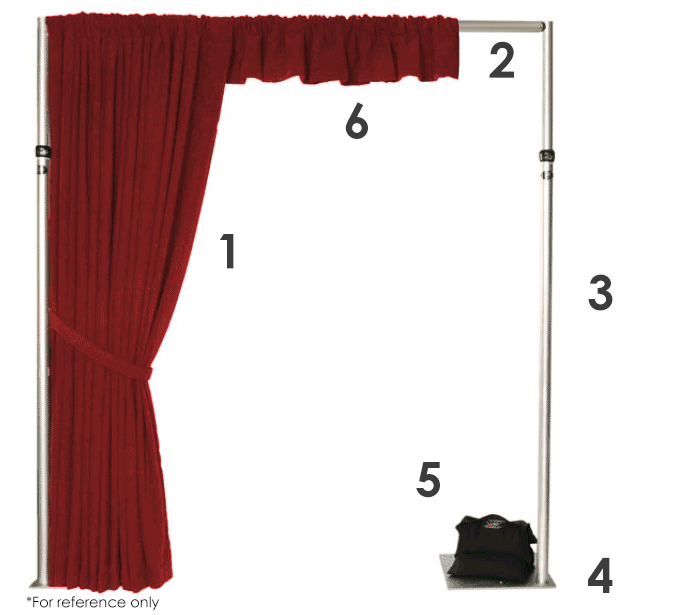 Stage curtains are commonly “tie on Drape” whereas pipe and drape rentals are usually ground supported and sleeved on. Both uses typically require fullness which is created by adding more fabric than the span being covered. 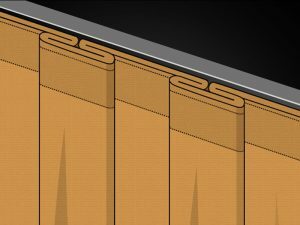 With pipe & base, curtains are most commonly sleeved over a telescopic drape horizontal by using a pocket sewn into the top of the drape panel. By increasing the linear length of drape over a fixed horizontal, Fullness is created. This extra fabric gathered over the pipe creates the pleated look that is sought. Alternative to fullness is flat drape which has limited use. 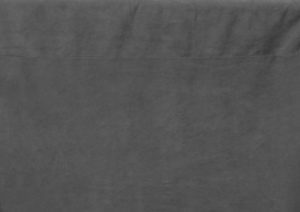 Flat rental drape should not be considered an alternative to a Cyc (cyclorama). Cys’s are hung flat too but are much longer in width allowing for limited to no seems. Pipe & Drape Rentals are rarely hung flat except when light blocking and utility masking is all that is required. Unless stretched with taunt, flat rental drape is usually not an acceptable look if clearly in the audience’s view. The use of fullness creates a more pleasing finished look adding depth of field, visual richness and increased sound and light absorption. 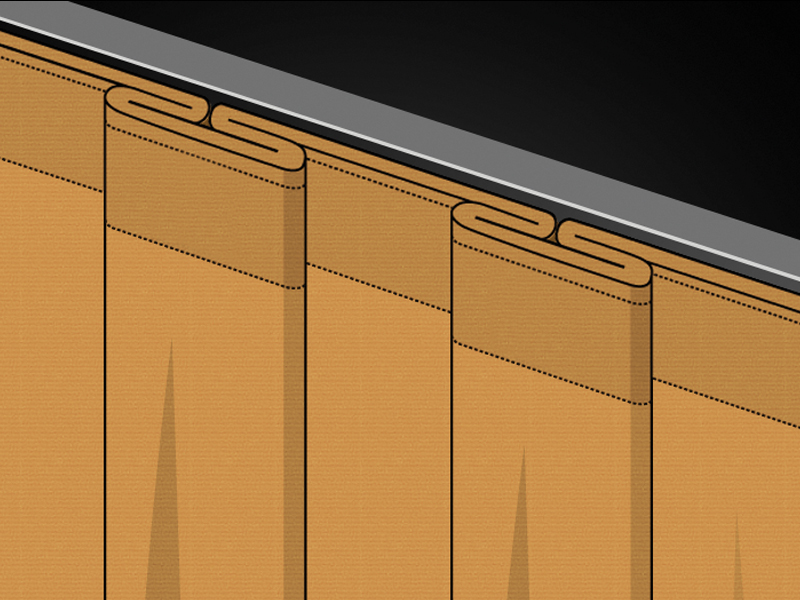 Depending on the fabric type, more fullness equals more opacity to the curtain wall since lighter weight fabrics are not usually opaque hung on their own. 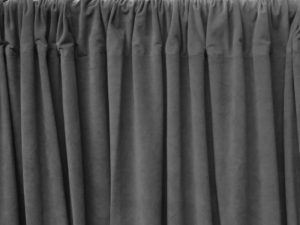 50% Fullness should be the minimum fullness used in a drape rental application. This equates to one and a half width of fabric gathered over the pipe. Example: 15’ of fabric over 10’ of linear span. Or, 12’ or 13’ over 8’ of span. Less than 50% fullness or only having 12′ or 13′ over 10′ centers for example can tend to look flat and incomplete. 50% should always be the minimum fullness in the drape dental market. 100% fullness equates to two times the fabric over the span. 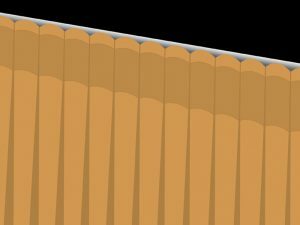 The example would be 20’ of flat fabric over 10’ of span. 100% would commonly be used in a Theatrical Curtains Main house Curtain or Film and TV applications to evoke a richness and quality. 200% to 300% Fullness would be used with ultra-lightweight sheer fabrics like Voiles can hung at 30’-40’ of fabric over 10’ of span especially in the rental drape when used on pipe and base. Required fullness is often dictated by the fabric type, desired look and weight. For example, medium to heavyweight velour’s (14-25oz per linear yard) usually offer a cost effective an acceptable visual look at 50% fullness. Whereas many of the lighter weight fabrics like polys, sheers, silks, SuperVel, banjos and other lighter weight fabrics can require hanging at 100% fullness or better to achieve the same rich full look. 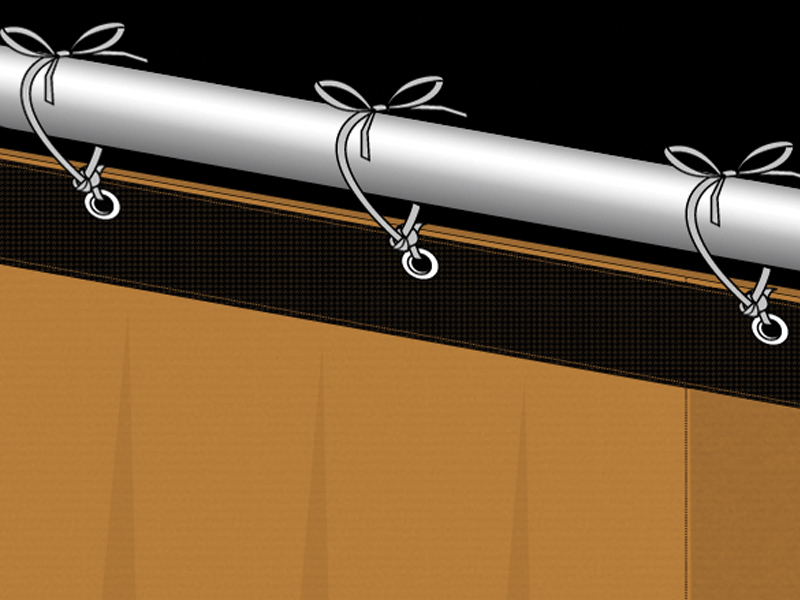 It should also be noted the rental curtain fabric comes in variety of un-sewn raw widths. 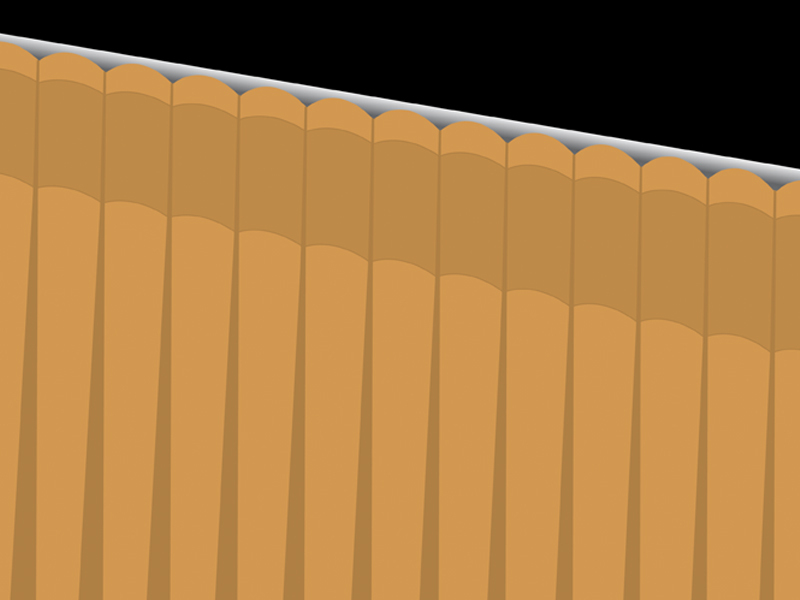 The most common widths of woven and knitted “event” fabrics are 54”, 60” to 64”w. Wide format fabrics can be as wide as 280cm (110”) to 320cm (125”). For example, when raw fabric widths are sewn together, and side hems are applied a 54” fabric of three widths ends up being approximately 13’ wide panel. If hung over 10’ that would equate to 30% fullness or a little more than 50% if hung over an 8’ span. 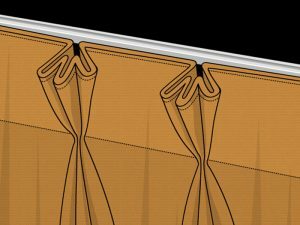 Thus, the use a 60”-64” wide fabrics sewn in 3 panel widths offers the most preferable solution of a 15’ wide drape, to be hung over 10’ wide pipe yielding 50% fullness. 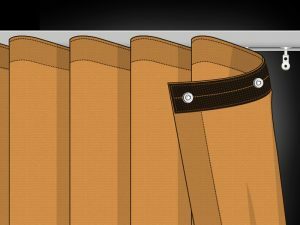 When the length of the drape is the same as the length of desired space, you will have 0% fullness, also known as flat drape. As you can see in the image, this drape has no texture and displays the drape taut. To achieve this look, you must take the length of desired space and add an extra 50 percent. Example: 100 feet of space, this look would require 150 feet of drape. This is called 50% fullness. To achieve this look, you must take the length of desired space and double it. Example: 100 feet of space, this look would require 200 feet of drape. This look is called 100% fullness. We offer a number of finishes based on your your needs. Our Original Tear Back Velcro Pocket comes standard with all drape orders. Custom finishes are available upon request. An overlapping of drape via a Velcro pocket. 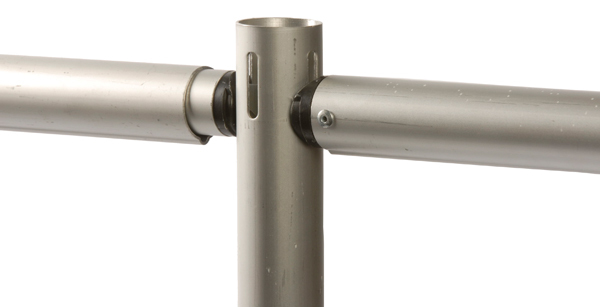 Allows for a seamless transition from one pipe fixture to another. A flat drape with snaps in its top finish allowing for varying fullness. Recommended for lighter weight drapes. The double pleating of drape in which the two outer folds face the opposite direction and the two inner folds face each other. Consists of two or more rows of gathered fabric using elastic thread in parallel rows. 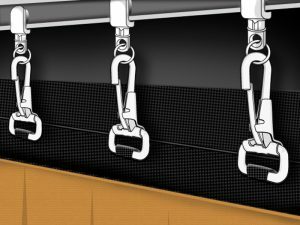 Sheering is used with a top treatment of hook and loop webbing. Provides a formal yet elegant gathering for our medium to high weight fabric at 100% fullness. A simple, looping tie system where the drape is hung immediately below the pipe with the cord looped through two grommets in the top finish. A traditional hanging system in which ties are slipped through a reinforced, metal grommet. A simple, smooth and sturdy hanging method traditionally used with Traveler Track.